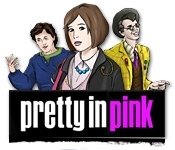 Grab a record, put on Culture Club, and head back to the nostalgic 80's in the Pretty in Pink Hidden Object game! This is your chance to relive the memorable story of Andie, Duckie, Blane, and the rest of the cast's unforgettable characters, but this time their fate is in your hands. Will the rich-boy Blane capture the heart of not-so-popular Andie, or will she end up with her tragically-in-love best friend, Duckie?